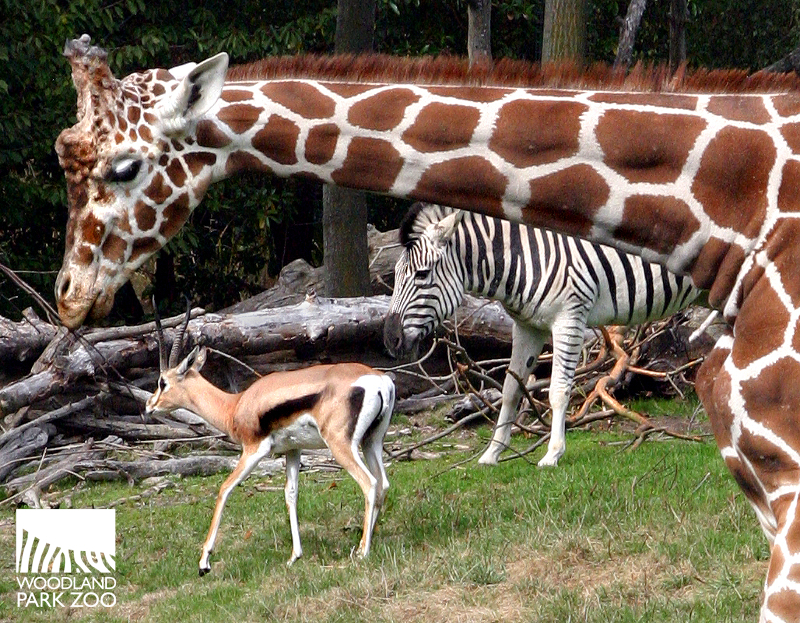 The African Savanna exhibit expertly mixes species. With a few new individuals and species added recently, keepers are working hard on getting all the savanna denizens to live in harmony! Archive photo: Dennis Dow/Woodland Park Zoo. The savanna enclosure is a mixed-species exhibit; a large space where zebra, gazelle, giraffe, ostrich, guinea fowl, Egyptian geese and now bontebok live together, hopefully in harmony. Some of the combinations of animals are more compatible than others. In the past, our antelope species (fringed-eared oryx and Grant’s gazelle) seemed to do fine together, although to be fair, age had mellowed them and they seemed to prefer nothing better than spending the afternoon lying in the warm sun, their sparring days behind them. So far the Egyptian geese haven’t seemed to mind the thundering hooves of the zebra as they gallop past. But perhaps some of you remember last summer when the giraffe and ostrich never seemed to be in the exhibit at the same time? No, you weren’t just imagining things. Our male giraffe, Dave, became quite nervous whenever our male ostrich, Mbuni, came near. The following routine played out over and over all summer long. Mbuni would approach Dave rather nonchalantly. Dave, possibly remembering his last encounter with the 8-foot-tall, 300-lb bird, would run away from him. Ostrich can be quite reactive, so Mbuni would of course give chase, and on-lookers witnessed the ridiculous spectacle of ostrich chasing giraffe in a comedy of errors that at first glance appeared rather amusing. In reality, this was a potentially hazardous situation with fences and drop-offs that could injure either animal. So for their safety we had to manage them separately for the summer. This photo from 2007 shows how giraffe and ostrich have shared the savanna exhibit for a long time, but their ability to co-exist peacefully is always kept interesting by the unique temperament of each individual animal! Photo: Dennis Dow/Woodland Park Zoo. Or you might remember our young male zebra chasing our young giraffe, nipping at his sides as a border collie might nip at his flock of sheep to keep them in line. Zebra are very territorial and Obi—sorry Star Wars fans, he is not named after Obi Wan but rather after his father Oblio—is no exception. He stands guard along the edges of the exhibit, watching for potential intruders into his space, keeping everyone within his domain in check. Have you ever observed the savanna exhibit from the school house in the African village? Have you seen Obi standing there on the hill looking back at you? He practically poses for photos doesn’t he? From my vantage point in the barn I always thought he was looking at guests, and he well may be. But one morning the zebra were unwilling to shift into their barn so I cleaned the exhibit while they were still grazing. Obi was standing on the hill by the pool looking into the school house, but there were no visitors there. From my new perspective I could see that Obi appeared to be looking at his own reflection in the glass railing. Does he recognize himself, does he like what he sees? Or does he think he needs to defend his territory against another male zebra? Only Obi knows. A keeper's-eye-view of Obi looking back towards the African Village school house. What are you looking at, Obi? Photo: Kelly Gross/Woodland Park Zoo. So now that we have added gazelle and bontebok into the equation, matters suddenly have become even more complicated. How are we going to introduce all of these species together? We will do so slowly, methodically and with care. We will start by introducing new animals to the exhibit by themselves. This allows them the chance to learn the boundaries and terrain of the exhibit while they are calm and relaxed. Then we will start mixing in the least problematic of the species, or sometimes, the least problematic members of the species. For example, sometimes we let the more docile female ostrich out first before adding the more reactive male. As the animals continue to acclimate to each other we hopefully create a mostly harmonious situation that will result in an engaging and dynamic exhibit for you, our guests. But please be patient, this process may take a while! Spring and summer may be rather exciting for the savanna exhibit this year, so stop by and take a look. You never know what you might see! 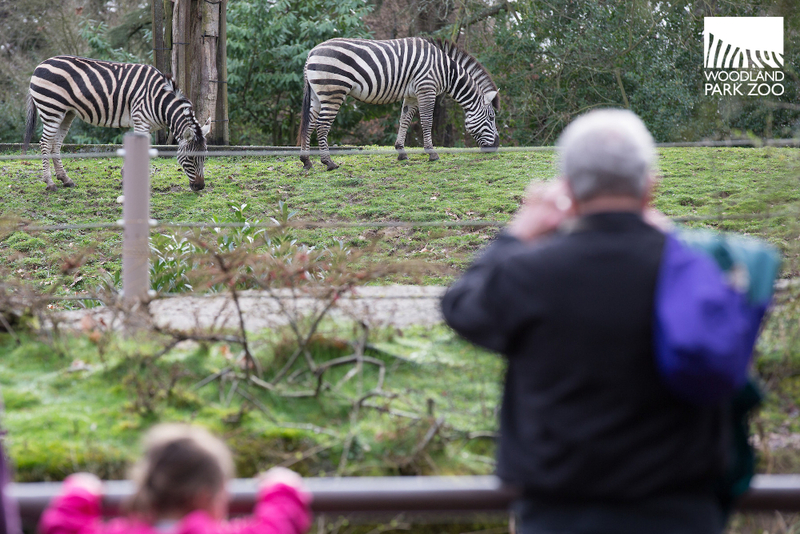 Don't miss your chance to celebrate these wonderful animals with us at Woodland Park Zoo's first Spring Safari: African Wildlife Conservation Day, coming up Saturday, April 16, 2016.